… was a contest/poll that was conducted by the Spanish Television Company Antena 3 and the radio broadcaster Cope. The final results were announced on 31st December 2007. I thought it might be interesting to take a look at the eight out of the twelve that I have visited and having completed that I thought I might come up with a personal alternative twelve. The Catalan architect Antoni Gaudi has a rightful place in the official list for his unfinished cathedral the Sagrada Familia in Barcelona but I make no apologies for including him again at number eight in my alternative Top Twelve Treasures but this time highlighting some of his other work and most of all my personal favourite the Casa Batlló. I visited Barcelona in 2005 before I had really heard about or fully appreciated the architecture of Antoni Gaudi so this place came as a real surprise. I had already visited the Park Guell, an imaginative but unfinished garden city and on a second sightseeing day I was walking along the Passeig de Gràcia in the Eixample district of Barcelona and heading for the Casa Milà when across the street I saw the most amazing building that I have ever seen that turned out to be the Casa Batlló, recently restored as a museum and open to the public. Antoni Plàcid Guillem Gaudí i Cornet was a Catalan architect who belonged to the Modernist Art Nouveau movement and was famous for his unique style and highly individualistic designs. 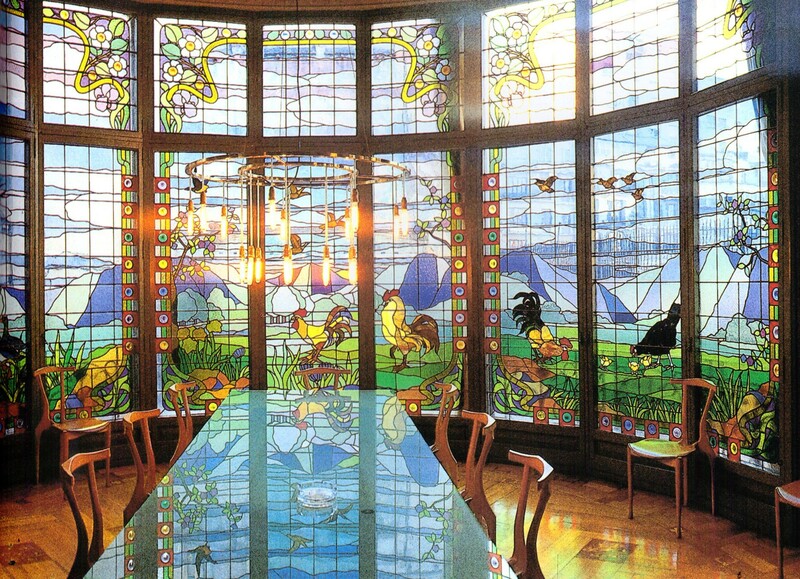 He designed Casa Batlló, in a prosperous middle class district of Barcelona, for a wealthy city Aristocrat who was carrying out a refurbishment of the property that had originally been built in 1877. The lower levels of the house were designed for the owner and the upper floors were for renting and the refurbishment took place between 1905 and 1907. Casa Batlló is a unique and fabulous building that defies any sort of description and is a building that has to be seen to be fully appreciated. From the road outside the building looks stunning and the local name for the building is Casa dels ossos, literally the House of bones and the building has a visceral, skeletal organic quality. Much of the façade is decorated with a mosaic made of broken ceramic tiles that begins in shades of golden orange and moves and merges harmoniously into greenish blues. It is a wonderful riot of style and outrageous architectural ideas and designs and stepping inside is like being given the privilege of sharing the inside of the mind of a genius. Every room is a treasure and the attention to detail is immaculate. The ground floor, in particular, is rather astonishing with tracery, irregular oval windows and flowing sculpted stone work. It seems that Gaudi’s objective was to avoid straight lines completely. My favourite part of the building was the roof with its forest of coloured chimneys decorating a terrace which is arched and is likened by students of Gaudi to the backbone of a dragon. A common theory about the building is that the rounded feature to the left of centre, terminating at the top in a turret and cross, represents the sword of Saint George the patron saint of Catalonia, which has been plunged into the back of the dragon. Like a lot of artistic people Gaudi tended towards eccentricity and because of his ragged attire and empty pockets, many cab drivers refused to pick him up as he walked about the city for fear that he would be unable to pay the fare. On 7th June 1926 Gaudi was run over by a tram and because no one recognised him he was taken to a pauper’s hospital. His friends found him the next day but when they tried to move him into a better hospital, Gaudi refused, reportedly saying “I belong here among the poor.” He died three days later on 10th June and was buried in the midst of his Cathedral, La Sagrada Família which even now remains unfinished and is due for completion in 2026, one hundred years after his death. This entry was posted in Arts and Crafts, Cathedrals, Europe, History, Spain, Travel, World Heritage and tagged Antoni Gaudi, Arcitecture, Barcelona, Casa Batlló, Catalonia, Culture, Life. Bookmark the permalink. It’s become cliched before I’ve even got there, Andrew, but I would still very much love to see Barcelona. Off to Madrid soon? Looking forward to the photos. When I went to parc guell the gift shop had a great pop up book of gaudi’s life for children. I flicked through the pages and the last one showed him being squashed by a pop up tram with blood squirting everywhere – gruesome! To me Gaudi is unique. I didn’t get to see all his brilliant works of art (because that is what they were), but the Sagrada Familia was top on my list of Barcelona must-dos. And then, there were other wonderful pieces dotted around the city. Didn’t do the Parc de whotsit either, but still, wonderful imagination for the works I did see. Oh, and I’ve read Lee’s Red Sky at whatever. Think I even wrote a review. A good one to read for a forthcoming Spanish trip or two. I love the one where he travels to London, works on a construction site and then wanders down through Spain. Ojala. Yes, good story but perhaps a bit far fetched. He has just walked from Vallodolid to Segovia in what seems a couple of days! 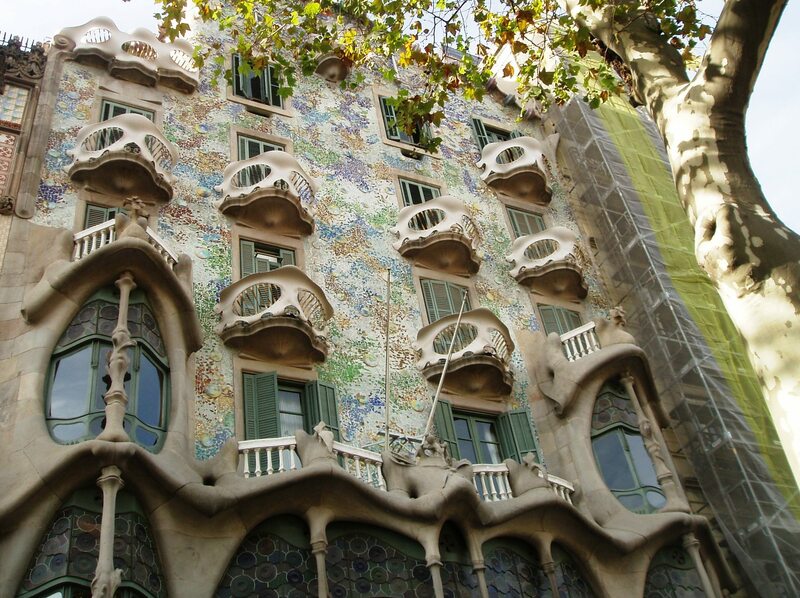 I liked Gaudi but not Barcelona – I was robbed there – my own fault for being careless but I wouldn’t go back all the same! There was quite a bit of criticism about the third book in the trilogy basically being a work of fiction, let alone far-fetched. Yeah, Barcelona didn’t feel particularly safe. I didn’t think the Ramblas was any great shakes either. Not a city I would rush back to, but apart from Madrid, I tend to like the Andalucían cities. Thanks for the link. I am enjoying reading the trilogy although I did skip ‘Cider with Rosie’ – like you I remember it from school! A read the first two (he’d not done Cider with Rosie at school), but got bored after the middle one and didn’t manage the civil war one. It seems two out of three ain’t bad. Did you ever find ‘Homage to Catalonia’? I bought it recently but haven’t read it yet. Forgot to say that I enjoyed your link to that FP masterpiece! I’m thinking about a new series. A weekly ‘The Best of the Worst of FP’ or ‘The Worst of the Best of the WP blogs..’ You get the idea. I could write an amazing critique for each one eg Boring. Poor style. Bad grammar. Too many clichés. Unoriginal. Vile theme. I think I’ll get right onto it. Maybe after breakfast. It’s great when an artist/architect is able to contribute so much to a city’s reputation and, dare I say, even transform its feel. Utzon did it for Sydney, Gehry’s Guggenheim Museum is the only reason most visitors choose Bilbao. Even Gaudi’s imitator Hundertwasser has done much to make Vienna less pompous and more fun. City fathers take note; these things are worth the investment and the controversy. In Vienna Kim made me walk miles to see some Hundertwasser and I’m not entirely sure it was worth the blisters! 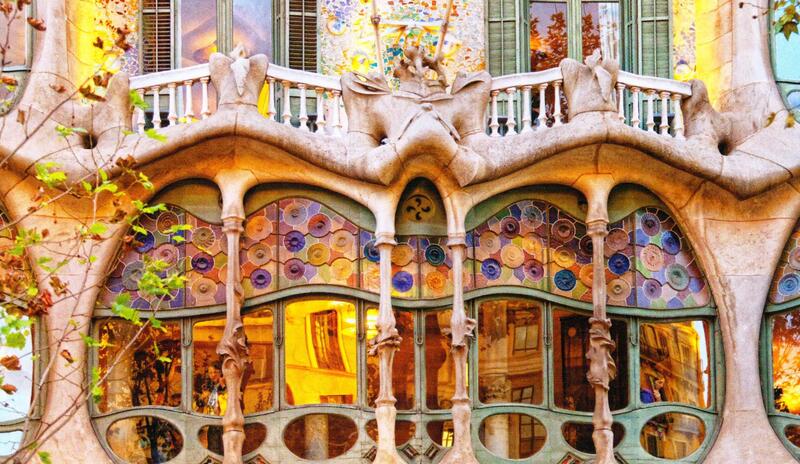 You are right about Gaudi though – he does seem to stand for Barcelona! I know I keep repeating myself, but I love this architecture! Only guessing but I can only imagine that he designed it but probably got a workshop somewhere to create it! Love it. Venice vs Gaudì … a tough challenge. Barcelona is just amazing! Yes, I’d like to go back. I am going to Catalonia this year so might get to do that! Thanks for the comment. I think I am with Mick on this one, I preferred Batllo but it is a very close call. 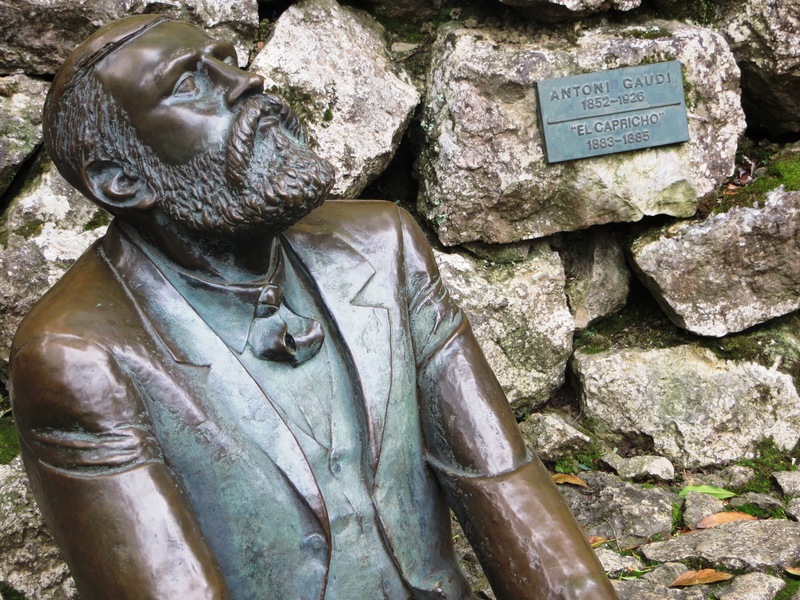 We were on the hunt down all the Gaudis mission, Andrew, but is there EVER enough time? I loved the work of Domenec Montaner too (probably not spelt it right). Luckily for a Gaudi hunter he didn’t stray very far from Barcelona but there a couple of buildings in León which we came across earlier this year. I agree with other comments on the Gaudi Trail in particular there simply wasn’t enough time. Though on my second visit to Spain we headed for Jerez and Cadiz, also to be highly recommended for their beauty and friendly local people. Two places that I am yet to go. Thanks for your comment. Love your pictures. We saw some of the Gaudi work, but not nearly enough and your pics have me anxious to return. Thanks for this window on these treasures. Thanks for stopping by. A unique man Antoni Gaudi who certainly left his mark on the World! I love the outside too. Amazingly I have never been inside though. It’s like a Dali painting brought to life. I love it. We are going to Barcelona in June and it is high on my list of places to revisit! A year without Spain is all the poorer! That is so true. We are going to Granada in May. We went there a couple of years ago but only really managed the Alhambra so this time we are going to take in the city! Lovely place. A real Moorish feel. Flying to Malaga? Alicante, staying with sister and then driving down for three days! That’s very nice of your sister to live in Spain for you!